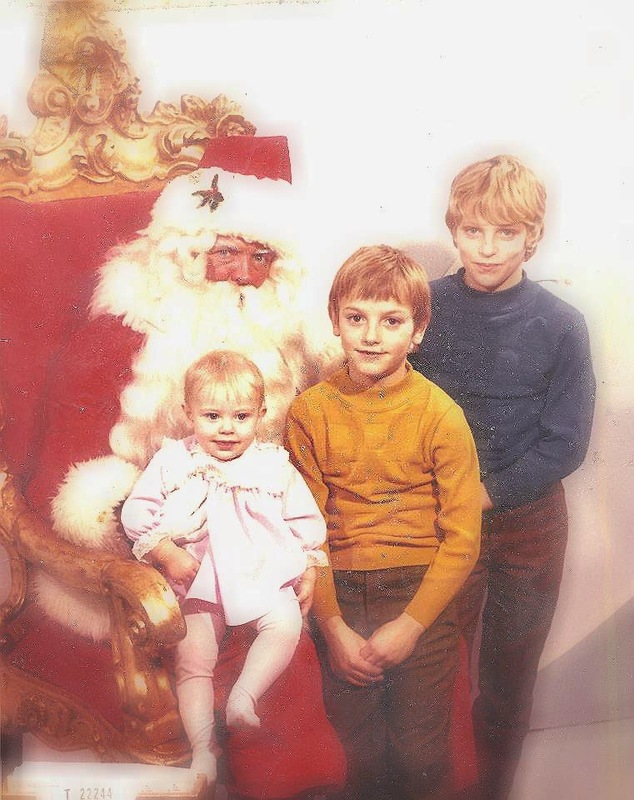 Days of Whine and Rosé: Life In An Autism Household : Santa Claus Is Coming To Town! The Toronto Santa Claus Parade has been a tradition in my family since long before anyone can remember. Everyone would bundle up to the point of being comical. Each year a few family members would head down early with wagons piled high with folding chairs, blankets, coolers filled with sandwiches and snacks, and thermoses filled with hot cocoa to save our traditional spot. I'm the youngest of 9 children, and there were always friends who tagged along so in the 70s and 80s there'd be at least 20 of us. In the 90's, all of us by then having young children, there'd be close to 50 of us. It was always a fun, communal affair, and as much a thrill for the adults as it was for the children. The numbers have dwindled over the years as the family has spread out over southern Ontario and Winnipeg, but we still always manage to 'represent'. When my son Eric was small, and after he'd received his diagnosis of autism, I used to insist on taking him to the parade. I wasn't going to let my child miss out on such an important family tradition simply because of a diagnosis. But it was often a nightmare. Eric's sensory issues made being in a crowd torment for him, and the sounds of the marching bands just drove him to hysterics. In my mission to ensure he didn't miss out because of autism, I was making him endure something he just simply did not enjoy. When I woke up to this fact, I stopped taking him. My other boys went down with the rest of the family, and Eric and I would stay home, watch the parade on TV and prepare the traditional post parade feast of chili, garlic bread and hot cocoa. It was difficult to accept at first, but just became part of the routine. I worked with Eric a great deal and was able over many years to lessen some of his sensitivities to the point by the time he was 10 we were able to join the family once again at the parades. Eric would bounce and dance and thrill to the sights and sounds. Most people around us had no idea how hard Eric had had to work to get to that point, but it didn't matter, because ANYONE could see his joy. Then 3 years ago, as is unfortunately typical in older teens with autism, Eric descended into crisis. When over-whelmed, which happened hourly, he could become extremely violent. So we had to stop going to the parade. Actually, we had to stop doing everything. My monkey became a virtual shut in. For 2 years we worked hard to help pull him out of the vicious circle of anxiety. And this year, for the first time since 2009, Eric was able to attend the Santa Claus Parade. On November 17, 2013, my eldest son Chris took on the role of spot saver, heading down 4 hours before parade time. This year, it would be just my 3 boys, myself and my granddaughter, my tiny but mighty family. I have to admit it, I was scared. How would Eric react, would I have to leave early with him? We worked out all probable scenarios and emergency plans ahead of time (amazing how much of my life is taken up with that task!) and how we would cope. I was confident all would be fine, but that niggling fear would crop up. Aside from all the challenges you face with a child with autism, you have to cope with bigoted cruelty from strangers. On a daily basis. Having an adult child with autism, the attacks, whether verbal or non-verbal, increase. And when you are in a crowd, at an event, the likelihood, and number of attacks compounds. So you tend to go into any situation on the defensive. Its the only way to deal with it. Pushing my granddaughter in her stroller, Eric, wearing his ever present Mickey Mouse ears, carrying his 3 foot tall Mickey Doll, holding my hand, I guided my babies down to the parade. There were looks. The ever present looks. The sneers. But Eric and Sammy were so excited about seeing Santa that I didn't give a damn. Then The Power Rangers walked by. Eric is OBSESSED with The Power Rangers. He jumped up, all 200+lbs of him, tried bolting out into the parade to go hug Yellow Ranger and take her home. I had not created an emergency plan that had predicted Power Rangers. I grabbed Erics coat, the only thing I could reach. Chris, who was sitting on the ground with Sammy, was able to grab Eric legs. We managed to hold onto Eric while he was screaming 'Power Rangers'. Fortunately the parade kept moving, and they were soon past. Eric sat down and settled back in to watch the parade. Emergency averted I became aware of eyes on us, all around. Mama Bear perked up, but was quickly calmed. You see, everyone around us had HUGE smiles. Not mocking smiles. Truly joyful smiles. A big burly man leaned over and patted Eric's back. ''If my wife would let me I'd take Yellow Ranger home too! '', then a woman ''Keep your eyes open, Santa's coming soon! '', and a little girl, no more than 3 ''I like your (Mickey) ears''. NEVER have we been so accepted outside the autism community. NEVER have we been in a crowd and felt such love. When Santa arrived, all adult eyes were on Eric, with smiles broader than you can imagine, and eyes brimming with happy tears. An elderly woman tapped my shoulder and said ''Your son is very lucky to be able to feel the joy most of us lose when we grow up'' As the parade ended, and the crowd broke up, everyone clapped Eric on the back or shook his hand and wished us Merry Christmas. Yes Eric, there is a Santa Claus. And on November 17, 2013 he gave your Mommy the greatest gift of all. He gave me the gift of the world seeing you as I do.